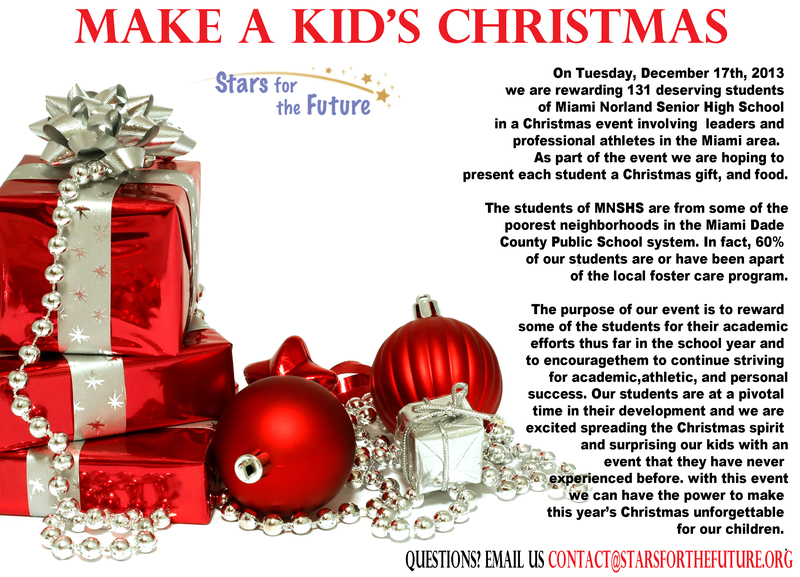 Stars for the future | Helping our Future stars Shine Bright!! Helping our Future stars Shine Bright!! On Tuesday, December 17th, 2013 we are rewarding 131deserving students of Miami Norland Senior High School in a Christmas event involving leaders and professional athletes in the Miami area. As part of the event we are hoping to present to each student a Christmas gift, and food. The students of MNSHS are from some of the poorest neighborhoods in the Miami-Dade County Public School system. In fact, 60% of our students are or have been a part of the local foster care program. The purpose of our event is to reward some of our students for their academic efforts thus far in the school year and to encourage them to continue striving for academic, athletic, and personal success. Our students are at a pivotal time in their development and we are excited spreading the Christmas spirit and surprising our kids with an event that they have never experienced before. By donating these gifts we can have the power to make this year’s Christmas unforgettable for our children. We hope that you will join us in our efforts.